The procedure has two parts: PROC048a & PROC048b use respectively radial & shear line force reaction around the supporting arc. PROC048a is suitable where there are reasonable radial stress paths both inside & outside of the arc. For example, where a substantial fixing bracket for a hydraulic cylinder is fixed to an in-plane plate of the supporting member. PROC048b is suitable where there is not a reasonable radial stress path inside the arc. For example, where a substantial fixing bracket is fixed (around an arc) to an unstiffened cylinder. 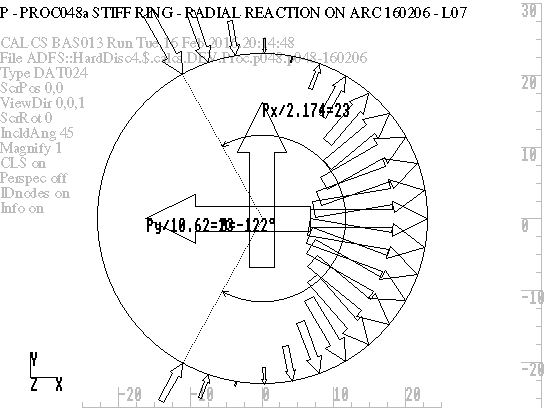 The reactive stress distribution, around the arc, is then by shear.